Sports Costs > How Much Do Karate Lessons For Kids Cost? How Much Do Karate Lessons For Kids Cost? 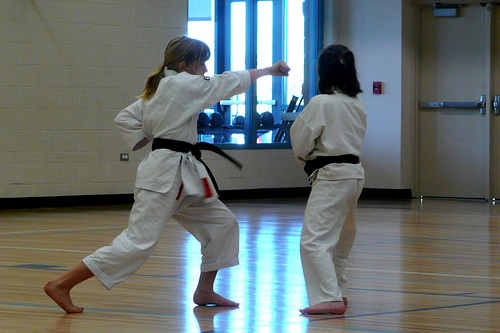 For children, typical karate lessons may include Kung Fun, Judo, Aikido or Tae Kwon Do. The cost of these karate lessons for children will depend on the number of classes, the instructor/school you choose and your geographical location. On average, a class that has around eight to 20 kids can cost $40 to more than $250 per month. The typical karate classes will last anywhere from 45 minutes to two hours. A private instructor may charge anywhere from $25 to $100 per hour, depending on his or her skills, schedule, and demand. Forum members on FertileThoughts.com said they paid anywhere from $500 for four months worth of lessons to as little as $35 for a 45-minute session one time per week. Since most lessons are conducted with a group of children, there is usually no one-on-one time. Instead, the instructor will teach basic moves, fundamentals and teaching discipline. Each class will focus on your child’s skill level, so each kid in the class will be on the same skillset. Typical sessions will be once per week and will last 45 minutes to an hour. Some plans can be unlimited. Some classes/schools may include uniforms or educational material; however, this is quite rare. A one-time registration fee around $25 to $55 may apply. With karate lessons, there are many extra costs you need to be prepared for. Generally, the uniforms, shoes, the belts, and additional equipment, such as nunchucks, won’t be included in the tuition price. Uniforms can be $25 to $55, while the additional gear can cost $60 to $95, depending on what’s purchased. Some instructors may require your child purchases additional reading material and DVDs. These are educational materials that will help your child better understand the fundamentals. To promote to another level, a test by a local dojo will be required. These testing fees, depending on this dojo, can be as high as $250. Your child will never be too young to sign up for karate classes. If you’re second guessing signing your child up, be sure to talk with a local instructor to see what they can do for them. To get the most bang for your buck, many experts will recommend you stay away from the chain schools. Locally owned karate schools are going to have a more personable experience that doesn’t have to abide by corporate rules. Visit the school before you sign your child up. It’s a good idea to see how they run their class as well as what kind of morals they have. It’s best to show up without letting the owners know to ensure that you can catch them in the act of teaching, rather than be prepared. If you feel that you’re in a high pressured sales act, it’s best to walk away. A true dojo won’t pressure his/her new students to sign up. Lessons are a great way to boost your child’s self-confidence as it can encourage your child to discover what he or she may be able to do. These lessons can introduce your child to other kids in the area who are passionate about the same thing. Karate lessons for kids are also a great way to help your child learn more about themselves. It can introduce them to breathing techniques and even meditation. Your best bet is to consider going to a school that isn’t chain related or specialized in karate. Most recreational classes, such as those offered by the YMCA, are going to cost considerably less. Be sure to compare at least three to five different schools before signing a contract. It’s essential to read the terms and conditions to ensure that you know what you’re signing. Some schools may offer a free introductory class so your child is able to test the waters before committing. Consider purchasing used equipment and uniforms since some children don’t like the first week of class, and may quit early. eBay is a great place to start to find cheaper uniforms.